This small one-roomed building, rather like a conservatory, or gazebo, is situated upon a rocky crest in South Yard, a few metres from Number 1 slip. The top of the building can be seen from outside the dockyard walls, at Mutton Cove. The Gazebo was built in 1822. Forty two years earlier King George III had visited the dockyard, and climbed a little hill that had remained following much excavation work in the Yard. Apparently he was rather taken with the stunning views from the top; of Plymouth Sound, of the Hamoaze, of the hills of Cornwall beyond, and of the dockyard itself. He asked for the hill to remain, as a reminder of the former topography of the dockyard; since then the rocky mound has been known as King's Hill. Now, in 1822, the gazebo was eventually built to commemorate that royal visit. A steep, but short, winding path leads from the road to the top of the mound. Half way up the path a statuette of a female is placed upon a ledge in the rock - the statuette's title is Vixen. She can be seen in the postcard, holding a type of spear in her hand. King's Hill Gazebo became a listed building, Grade II*, on 13 August 1999. [English Heritage Building ID: 476441]. A photo of the Gazebo, by David R. Grounds, may be found on the Images of England website. It was not only the Gazebo that was listed; the railings, piers and gateway are viewed as an integral part of the structure, and were also Grade II* listed on the same day. [English Heritage Building ID: 476440]. 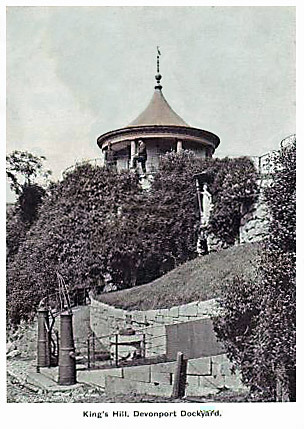 The gate piers are interesting - unfortunately they're not too clear in the postcard image, but consist of a pair of inverted muzzle-loading cannon, with GR inscriptions, linked by an overthrow with a gilded finial. The Gazebo is now on the Devonport Heritage Trail. A waymarker plaque, made by blacksmith artists Thrussell and Thrussell, can be seen on the low wall at the bottom of James Street, Mutton cove.